MONTREAL -- McGill University is dropping the Redmen name for its men's varsity sports teams, effective immediately, the university announced Friday. Even though the name was not initially adopted as a reference to Indigenous peoples, that association was made in the 1950s when men's and women's teams came to be nicknamed the "Indians" and "Squaws." Some teams later adopted a logo with an Indigenous man wearing a headdress. "Today, 'Redmen' is widely acknowledged as an offensive term for Indigenous peoples, as evidenced by major English dictionaries," Fortier said. 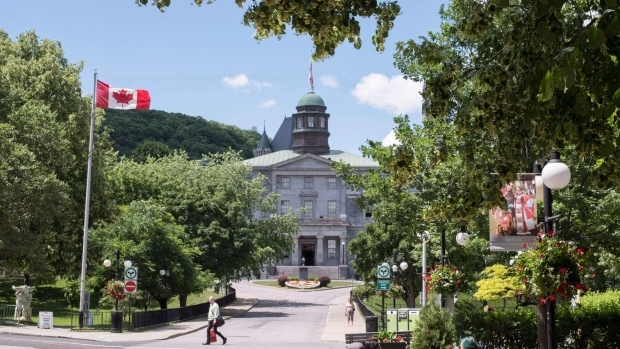 "While this derogatory meaning of the word does not reflect the beliefs of generations of McGill athletes who have proudly competed wearing the university's colours, we cannot ignore this contemporary understanding." She said the name "is not one the university would choose today, and it is not one that McGill should carry forward." One unnamed Indigenous student was quoted saying that seeing Redmen jerseys in the gym "felt like a dagger" and that being called a "Redman" made him sick, while another told the group she didn't feel accepted in the university and "felt like a ghost." On the other side was a group of alumni who reported feeling such strong attachment to the Redmen name that they said they would never again donate to McGill, would discourage their children from applying to the school and would "consider McGill dead to (them)," if the name were dropped. "I have learned about the true depths of the pain caused by the Redmen name," Fortier said. "I have heard from Indigenous students at McGill who feel alienated by the name. They feel disrespected and unconsidered. They feel conflicted over their rightful pride in being Indigenous people, and their pride in being McGill students." The Indigenous student who led the fight against the Redmen name said he was "ecstatic" at Friday's news. "Walking through McGill Athletics facilities, it can feel incredibly isolating, it can be insulting to see a slur like the Redmen printed on jerseys and printed on shirts and to see people proudly wearing this slur," said Jirousek. "It can make you feel as you don't belong in the space." "Reconciliation, I think, will merit these type of difficult moments, these moments of critical self-reflection that will have plenty of people uncomfortable with the necessary steps we need to take in order to address the grievances of the past," he said. Fabrice Labeau, the interim deputy provost who will lead the name search, said the university wants a unifying name that everyone will be happy to cheer for. "This is a decision we've taken, there's no question of going back," he said. "Everyone in our community will understand the reason for this change, even if they don't agree with it right away. "We need to be aware of the damage that has been done by the Redmen name, so I don't believe in getting rid of these artifacts," Jirousek said. "I think they should be preserved in a way that we can learn from the sins of our past."